This mission-style footstool is fancier than most. Use it for propping up your feet or as a step stool. 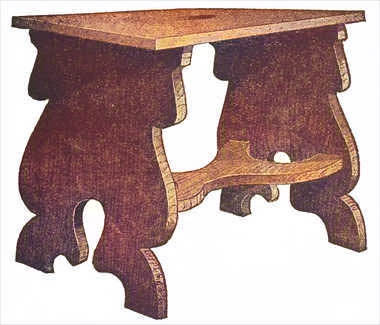 Click here for detailed mission style oak footstool plans. This footstool can be made from any kind of wood, but when it is intended to be finished in mission style, quarter-sawed oak will produce the best effect. 1 top, 1 by 9-1/2 by 12 in., S-1-S.
2 legs, 3/4 by 8 by 12 in., S-2-S.
1 brace, 3/4 by 7 by 9 in., S-1-S.
Order these pieces cut to length, squared and sanded. A full-sized layout of the front view should be made to get the correct bevels for the legs and brace. The design of the legs can be varied to suit the fancy of the maker. For such a design as shown draw one-half of it on paper; fold on the center line and with scissors cut both sides of the outline by following the lines drawn. Trace around this pattern on the wood, and saw out with a compass or keyhole saw. The sawed edges should be smoothed and sandpapered. The perforation in the top board is made by first boring holes, then trimming out the edges with a sharp chisel. Be sure to get the best side of the board up. The legs are fastened to the top and to the braces with 1-3/4-in. wood screws as shown in the detail drawing. After the stool is assembled, go over it carefully with fine sandpaper and remove all rough spots before applying the finish. This finish can be any one of the many different kinds supplied by the trade for this purpose. If this stool is well made and finished, it will be a useful and attractive piece of furniture.